Today, we are commencing the translation of Periva's discourses on Soundarya Lahari, which has been very aptly translated in to English by Prof VK. 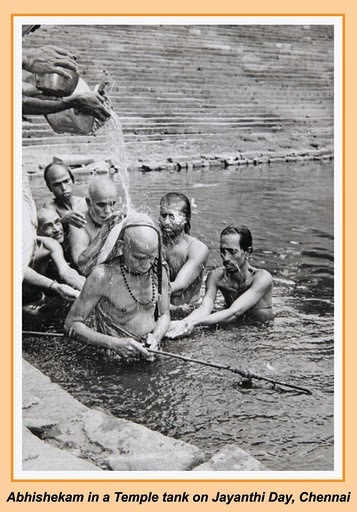 "How could Adi Shankara, who preached the jnAna mArga, have promoted this work (Soundaryalahari) of bhakti? It cannot be his", say some who profess Philosophy. But our Acharya was not a professor who isolated philosophy as a separate discipline. Having written very profoundly on advaita and its deepest implications in his several commentaries and the other works of his, he promoted the spiritual pursuit of the common man by writing and talking about the need to follow ones swadharma by Karma and Bhakti. His intent was to raise the common man from his own level. For this purpose he went from one pilgrim centre to another all his life and composed hymns after hymns and also established yantras in temples. The philosophers argue: JnAni says everything is One. But Bhakti can happen only when there is the duality of the devotee and the deity. Therefore, they say, the jnAni can never be a bhakta. These philosophers cannot themselves claim to have the Enlightenment of advaita ! But there have been those who could have so claimed, like the sage Suka, Madhusudana Saraswati or Sadasiva-brahmam. 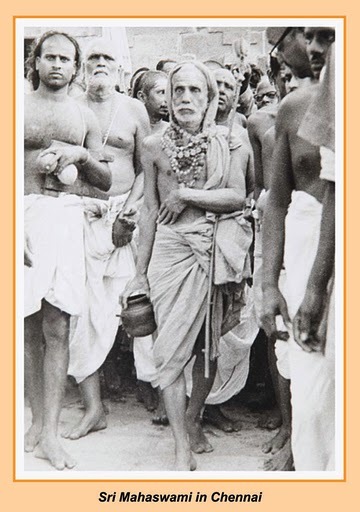 If we carefully study their lives we will know that they had been devotees of God in the fullest sense of the word and have themselves written works of Bhakti. 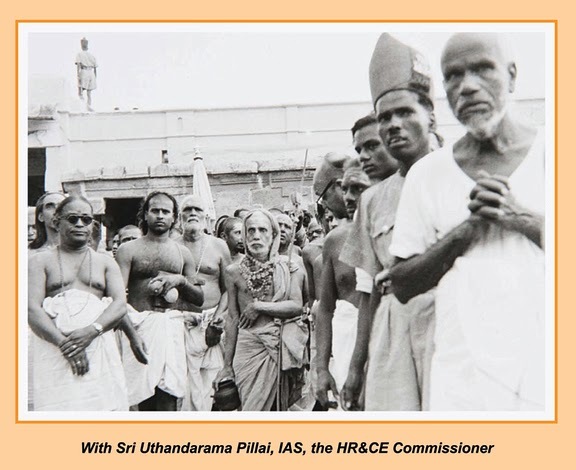 Even in our own times Ramakrishna Paramahamsa has been a great devotee of Mother Goddess. 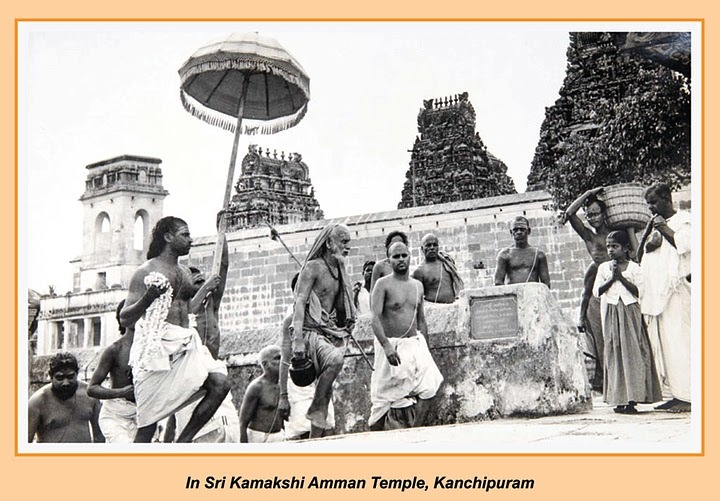 Ramana Maharishi has done works of devotion on God Arunachalesvara. We now roam about calling something as “I”, “I”. In reality this “I” belongs to Him alone. If this awareness is mentally and intuitively attained, then our roaming about will cease. If we realize that there is no case for personal likes and dislikes, then there will be no roaming about. There will only be complete peace and quiet. The term Swami itself has been formed to emphasise that we have no right to anything on our own; we are His property to be used at His will. Such a realization is Saranagati (complete surrender) that is the ultimate ideal of Bhakti (devotion). There is another justification for practicing Bhakti (devotion). There is no pleasure in living without love. It is the gist of experience that there is incomparable pleasure in love. But the person we love will separate from us one day or we will separate from him. Then the love instead of being source of pleasure becomes the cause of grief. Isvara (God) is the only permanent entity, which will not go away or separate from us. If we place our love on Him that love will give us pleasure eternally. On maturing this love leads to the awareness that He is one and all. This will not have the basis that love towards one, means hate towards another. Since He is in all beings, we shall have same love without any discrimination towards all. Thus Bhakti (devotion) helps us to avoid being loveless and waste our lives. There is no need to try directly for liberation, giving up the practice of Bhakti. The constant practice of the latter itself leads to liberation. Hence it is sufficient to pray not for liberation as such but for the gift of Bhakti (devotion). As the Tamil poet Gopalakrishna Bharati says, practicing Bhakti gets one Moksha (liberation). Sri Sankara Bhagavatpada has composed Stotras (prayers) wherein all deities are looked upon as the embodiment itself of Brahmam (Supreme God). 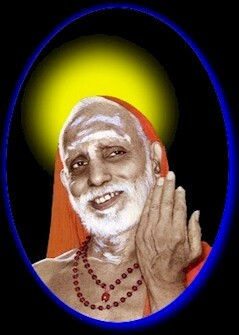 He has also explained the characteristics of Bhakti (devotion) beautifully in Sivaananda-lahari. He has cited five apt illustrations. Just as: the seed of azhinjil (or ankola) tree merges with the parent tree; the iron needle is attracted towards the magnet; the devoted wife is immersed in thoughts about her husband; the creeper grows around the tree; and the river merges with the ocean: Bhakti is the constant immersion of the mind in the thoughts about the lotus feet of Pasupathi (or Siva). It is stated that there is a tree called Eru Azhinjil. Its fruit ripens, falls on the ground and breaks open. Then the seeds from the fruit, attracted as it were by a sort of force of gravity, move gradually and attach themselves to the parent tree. Thereafter it is said that these seeds form part of the latter and disappear from sight. We, who have become separated from Bhagwan (God) should similarly gravitate towards Him; and ultimately become one with Him. We with our countless wants have but limited prowess. On the other hand, the want-less God is all-powerful. We are in depths. God is in great heights. Not only is He supreme in prowess and knowledge; He is highest in mercy too. Therefore He lifts us up from our depths and makes us fulfilled. We are deficient. He is the fullest of the full. Only His fullness can fulfill our wants and make us also full. He is such an all-merciful. If we worship Him, He dispels our shortages. If there is shortage it means something is wanting. If our wants completely disappear, we can become full then and there. God fulfills our wants. He leads us to the satisfaction of fullness where we feel complete lack of wants. Then that supreme height (God) fills our depths; and lifts us who have been in depths and makes us equal to and the same as Himself. Swami remains Brahmam (action-less God) residing inside human beings; He is also the outside entity Isvara who performs all actions. Human beings are swimming in the waves of samsara (the world or the constantly repeating cycle of birth and death). Seers are standing in the fields on the other side of the lake. In between is the shore of the lake. Due to its intervention the seer is unable to see the lake. He is not visible to the human beings in the lake. Swami on the other hand is in the shore between the two. Hence the title, Thatasta. He sees the universe as well as the Seer; the latter is bereft of awareness of the world. God is capable of calling the person in the field (the Seer) and instruct him to rescue the sinking man and place him on the shore. God is fully aware of His omniscience. But He playfully looks upon as distinct (from Him) those persons who consider themselves separate and distinct from Him. His greatest act is to liberate people from Maya (illusion). That act is known as anugraha (grace or blessing). There is no other path but this Anugraha to attain the state of advaita (non-duality or oneness with God). Soliciting this Anugraha again and again is termed as Bhakti (devotion). Believing God is full of mercy and capable of gracing us we have to pray with extreme sincerity and devotion. This is called Bhakti. Truth is the absolute ultimate, no, it is tapas (austerity) that is ultimate. No again, it is dama (control of mind); it is only shama (control of the mind) -- and so on goes the Narayanavalli, detailing the greatness of one after the other (Mahanarayana Upanishad. Anuvaka 78). But finally, it says: “It is none of these that is ultimate. SannyAsa is the Ultimate Principle. The Creator Brahma Himself has said so”. When one reaches the higher rungs of the ladder of sAdhanA to know the Atman, it is possible only by the SannyAsi who has left karma behind. Atma is inaccessible by karma. It has to be enquired into, meditated on, further meditated on, and then in due course even that meditative action has to stop – only in that stage one can know the Atman. 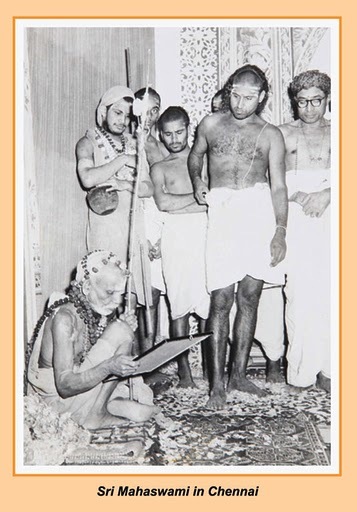 In the same mantra, the question is raised: "How will a jnAni behave?". And the answer comes; "Howsoever he may behave, he is just such, he is a jnAnai". In other words he is not regimented by any shAstra or regulation. For such a person , where is the need for the rule that he should adopt the fourth Ashrama among the four Ashramas? 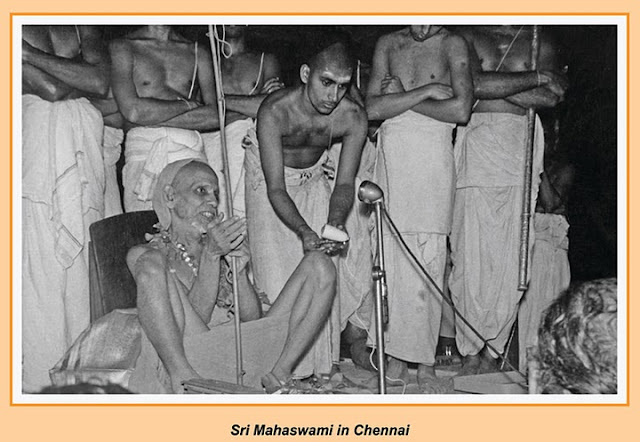 So we should not interpret "AtmAnaM viditvA" to say "after learning by experience" but should interpret it as "understanding by the intellect".It is clear therefore "He who confirms by his intellectual understanding that what he has heard and learnt from the advaita-shAstras is true, now throws away all his desires and becomes a sAnnyAsi" is what is said here. There is a custom of offering me a PoorNa-kumbha (the formal ritual reception with a vessel full of purified water). At that time, as well as in your marriages and other functions when you offer the sacred offering to the Achareya, there is a mantra which is recited by the Pundits. 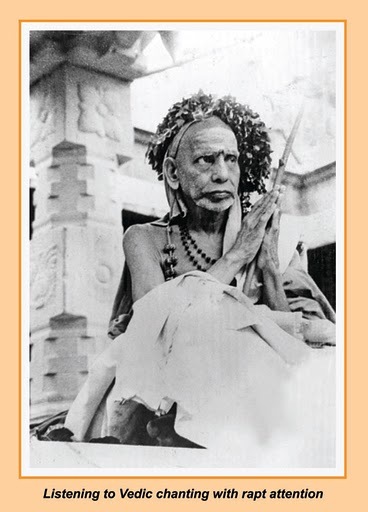 In BrihadAraNyakaM also (IV-4-22) the qualifications for sannyAsa are enunciated: "The one who wants the spiritual world, renounces the present world and his home. Because that is how in ancient times the learned ones whoi studied the spiritual vidyA just discarded the desire for kith and kin, desire for wealth and property and desire for the other worldly attractions and they left home literally as beggars". In every work there are always expressions of different opinions but following them there is also the reconciliation passage that comes later. So also in this BrihadAraNyakaM, earlier to this passage in (III-5 ) it says "AtmAnaM viditvA", that is, cognising the Atman, ‘discarding desires for kith and kin, wealth and property and the other world, they run away as beggars’. Here the words "AtmAnaM viditvA" looks like saying ‘after one has cognised the Atman’. 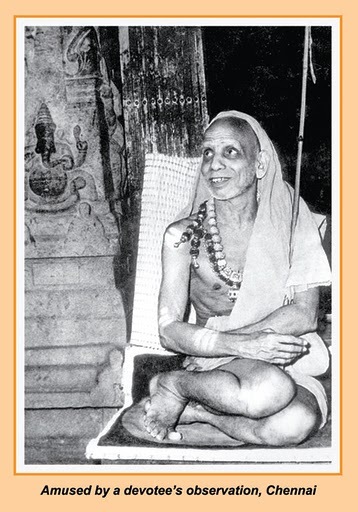 It appears that this means, in contrast to what was said earlier, namely the earning of eligibility for SannyAsa for the sake of earning the Atma-jnAna, it is now said that sannyAsa takes place after the acquisition of jnAna. This is a legitimate question; but the answer comes if we carefully examine the context. Tayumanavar, in one of his songs, refers to the three processes, ‘shravaNa, manana and nidhidhyAsana’. Tirumoolar follows the ‘shravaNa’ word by *guru-vuru-cintittal* meaning the memorisation of the mantra taught by the guru. The Tamil word *uru* here means mantra-japa that is manana. By thus memorising and repeating the mantra one is automatically led on to the next stage of ‘nidhidhyAsana’. There is an old saying *sannyasya shravaNaM kuryAt* -- one should do the ‘listening’ part only after taking up sannyAsa. Once we have passed the SAdhanA-set-of-four, we come to the third stage, the final stage. No one here (in the discourse audience) is likely to go to that stage. Because it is a stage to be performed after one has renounced all wealth, possession, property and kinship. So possibly it may not have to be explained here. But still, since I have said so much about advaita-SAdhanA, let me just touch upon it for the sake of completion. SAdhanA, according to the necessity and capability of the sAdhaka. Listening to the teaching; confirming what one hears by repetitively thinking about it; and keeping the antaHkaraNa in that thing and meditating on it. Therefore I should not leave out telling you about it. But note that this statement does not come in Bhakti Yoga or about those generally termed to be bhaktas. It comes under ‘ VibhUti Yoga’ where the Lord’s Glory and Power is declared to be manifested in the whole universe. In short He says those who see such Godly Power and Glory in everything repose their mind and life in the Lord and revel in thinking and talking about Him. However they are not dry philosophers, but ‘bhAva-samanvitAH’, that is, knowledgeable people (budhas) who are involved in God with Love. In other words they are like JnAnis as described by the Acharya. Further on when the Lord continues, He does not propose to give them Bhakti Yoga. He specifically promises to Grace them with the path of JnAna, that is, buddhi yoga; and burn any remnants of darkness of ignorance in them by the Lamp of Wisdom (jnAna deepena). Nowhere has he said in Bhakti yoga, about revelling in the multifarious qualities of Bhagavan, weeping, laughing, dancing, singing, going into unconscious trance, establishing relationship with God through various moods like, servitude, filial affection, etc. or enjoying the ritual bathing (abhisheka) or decoreating the deity, etc. The qualities that He enunciates, viz., love and affection to all beings, getting rid of the feelings of ‘I’ and mine, equanimity with respect to happiness and misery, fear and delusion, contentment with whatever one gets and being independent of possession and property – all these qualities are only those of the JnAni! Those who have turned all their mind toward Me, who have reposed their very lives in Me, who are constantly enlightening each other and talking about Me and for whom that is the satisfaction and that is the delight!